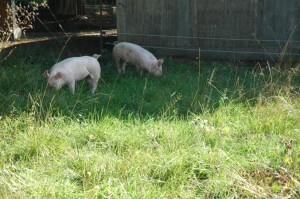 Our pigs have grown significantly during the last month, and it was time to let them out into the larger pen. 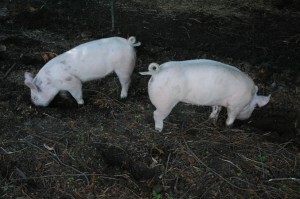 They have been living in a 16′ square pen, and they’ve tilled every inch of it with their noses. The new larger pen is about 80′ by 50′. First, the electric charger is hooked up with 10,000 volts at the ready. 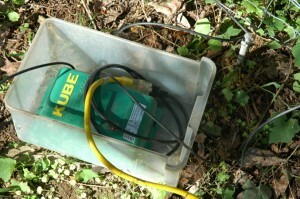 The areas we don’t want them to get into have been cordoned off using electrified polycord. These areas include the sides of the barn (we don’t want them chewing on the walls or tunneling), and a section which has both the well pump in it and some buried trash from the previous owners. 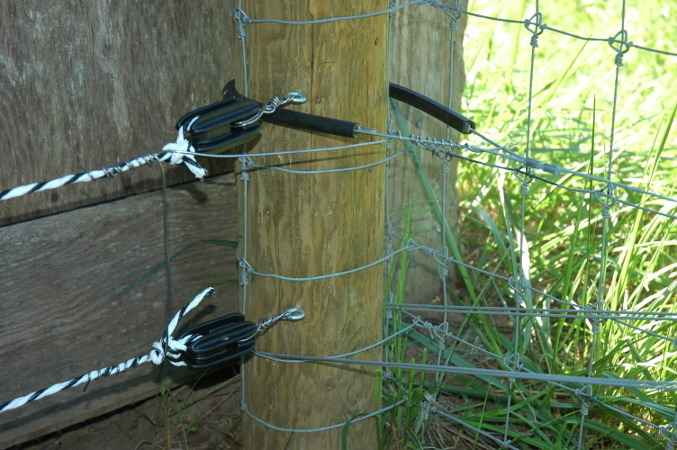 Polycord insulators were wired directly to T-posts or to eyebolts screwed into the wood posts. 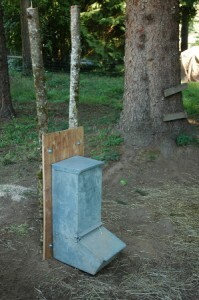 One of the pig feeders that we picked up cheap was mounted on two hazel nut posts cut from our property and bolted to a weathered scrap of 3/4″ plywood. 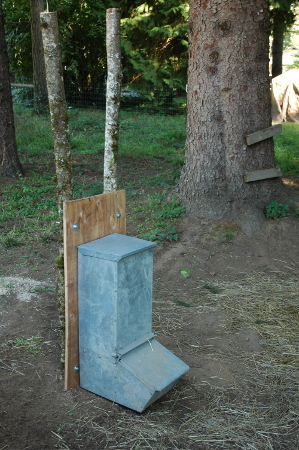 We shall see how well the feeding station holds up. At any case, it barely cost us anything to put together. 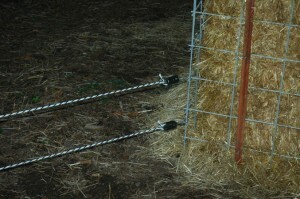 Lee removed one section of their cattle panel pen and the pigs were off. Okay, more like they slowly inched their way out and instantly started turning over the new ground with their plows snouts. 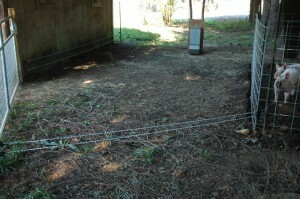 The pigs soon found the electric wire and tried it out. There was squealing and they ran back to the safety of their pen. It seemed to be a wash, rinse, repeat episode of pigs trying out the wire and then running back to their pen. Life is exciting when your world has been expanded. They did manage to get into the cordoned off area. 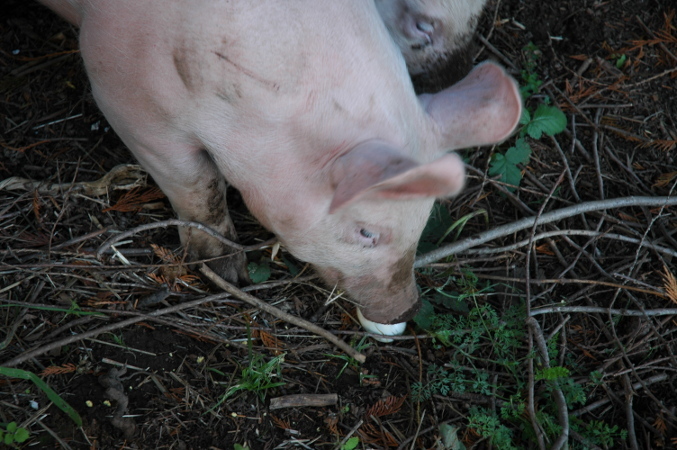 We used boiled eggs (which they LOVE) to lead them back out. 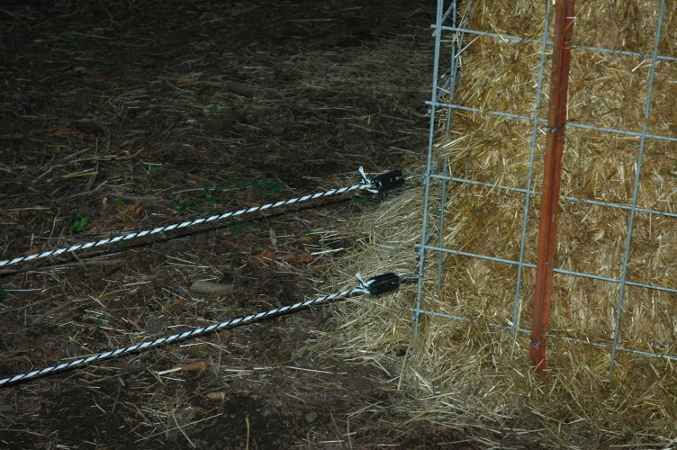 We added some stakes to the polycord so we hope that tomorrow there will be no pig escapes into the forbidden zone. 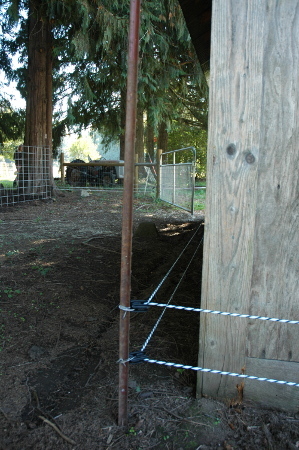 Electric fences are a psychological barrier, not a physical one, so it’s good that there is a stout fence all the way around. 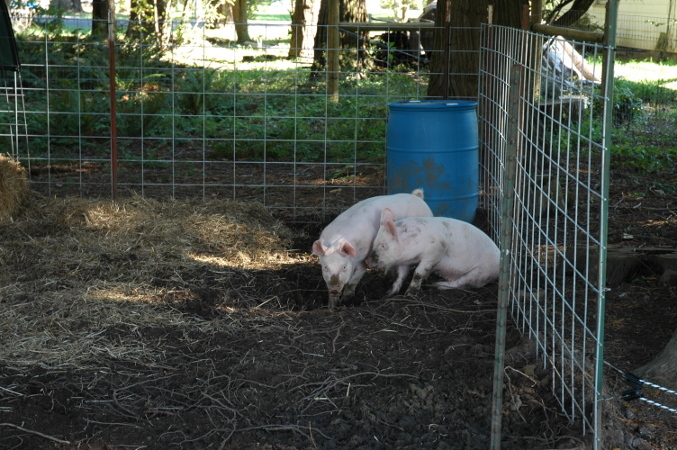 We felt bad for them getting shocked (one pig bit the cord .. ouch), but they will eventually learn the boundaries and then have lots of fun digging through tons of new soil. It’s very possible we are neighbors! You have my email now so don’t hesitate to get a hold of me. I think we could share a lot of info. 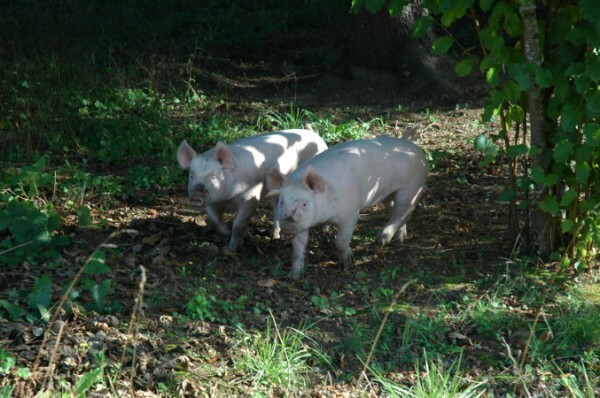 Dan and I were talking yesterday about pigs, especially where we’d put them. Thanks for the scoop on your fencing scheme and routine. Your pig posts are very helpful. So, have you named them? I’m thinking Hambone and Lardbutt would be apt. 🙂 You could call them Hammy and Lardy for short. I am really enjoying the posts. Lauren – I’ve been browsing your blog since you posted here. Sounds like we are in similar boats. Nice to see you using top-bar hives. If I’d had more free time this summer I would have built one of those instead of / in addition to the Langstroth we tried to get going. Leigh – The pigs definitely would have benefited from an earlier introduction to the electric fence. They are very slowly starting to explore their pen. We had hoped they’d be plowing through the grass within a day or two, but it may take a couple more weeks still before they get confident enough to do so. Benita – They’re pretty much unnamed. Robin talked about calling one Baconetta, but in practice we just say “pig pig”, or we say “the fat one” and “the dumb one”, or something to that affect. As long as we bring them eggs, they don’t seem to mind what we call them!